The Gates Twinjet helicopter was a planned luxury private helicopter designed and manufactured by the Lear Jet Corporation. The Lear Jet Corporation is notable for being the first makers of helicopters built specifically to be luxury, privately-owned passenger helicopters. Before, helicopters that filled this market segment were converted from military or civilian utility helicopters. The Twinjet was no different in this regard. This twin-turbine craft had seating meant for eight passengers and two crew in its corporate layout. There was also the option of a high-density layout, which could accommodate a pilot and 12 passengers. The Twinjet was to be powered by two Garret Air Search TSE 231-P2400 turboshaft engines. They had a peak takeoff output of 474 shaft horsepower each which could be sustained for 30 minutes, but the normal operating performance was 407 shaft horsepower. The engines were meant to be mounted in a novel blister at the top of the helicopter. This was part of the overall design goal that aimed to maximize cabin space. The fuselage was also designed to be very aerodynamic. Things were looking good for the Twinjet and it was featured in several articles, but the recession of 1970 put a permanent end to the project, despite the fact that master tooling and major production facilities were near completion. 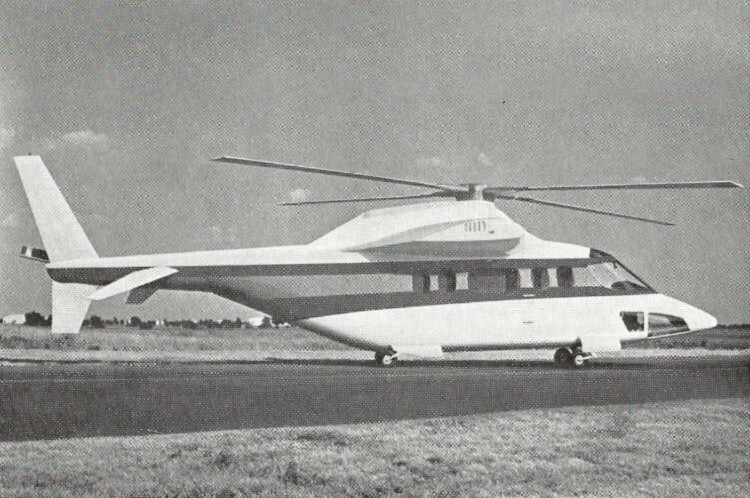 In the end this helicopter never existed as more than on-paper designs, artist’s impressions and a few wooden mockups. Do you want to comment the Lear Jet Industries Gates Twinjet helicopter?